Every year before Maker Faire we spend a day in San Francisco to visit the Noisebridge hackerspace, Instructables, and other open hardware/DIY/hacker friendly people. Noisebridge is located in a neighborhood called the Mission District, and it has dozens of delicious Mexican taco shops called taquerias. 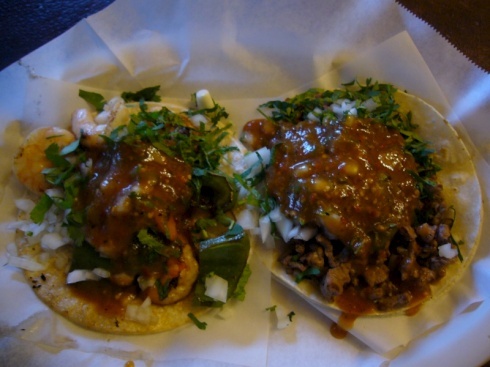 We try to eat a carne asada taco at every shop, but there’s so many it’s an impossible challenge. 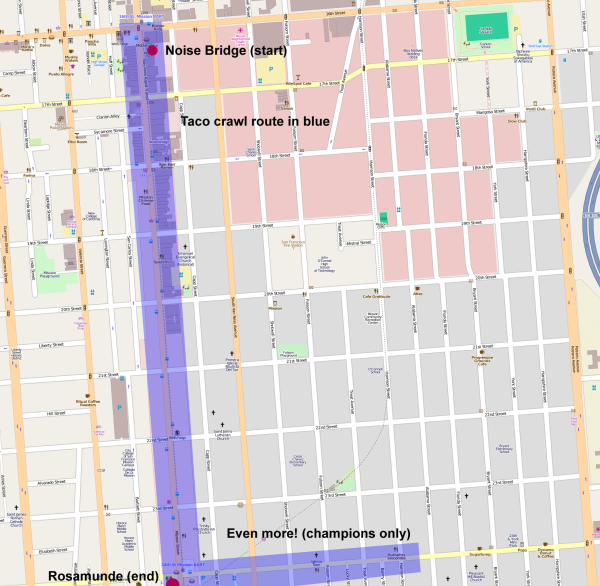 If you’re in San Francisco for the Maker Faire early please join us for the Dangerous taco crawl from Noise Bridge hacker space through the Mission District on Thursday the 15th. We’ll meet at Noise Bridge near the 16th and Mission Street BART stop at about 6pm. If you can make it please give us a shout via the contact form. Make gave us two free tickets for friends, we’re going to give them away at the taco crawl. If you don’t have tickets yet let us know on Thursday and we’ll give you our extras. Route map below the fold. Hit us up on the contact for for a cell number if you want to track us down after the crawl is under way. Note that Noisebridge is a block further south than the dot. It is actually printed on the map below our route highlight. This entry was posted on Tuesday, May 6th, 2014 at 11:00 am	and is filed under Maker Faire. You can follow any responses to this entry through the RSS 2.0 feed. You can skip to the end and leave a response. Pinging is currently not allowed.